This pumpkin-tastic season isn't over yet. So when Sonia heard the buzz about a "delicious" new kind of yogurt at TJ's via Instagram, she rushed out to get some for a review. She heard rave review after rave review as people posted pics of the product repeatedly. Pumpkin yogurt sounded weird to me, but I'll try almost anything once. Sonia's facial expressions are frequently enigmatic and very difficult to translate, even after 3 years of marriage. And her reaction to this stuff was no different. She blankly stared into space and smacked her lips. The blankness slowly became a grimace. I tasted it myself. 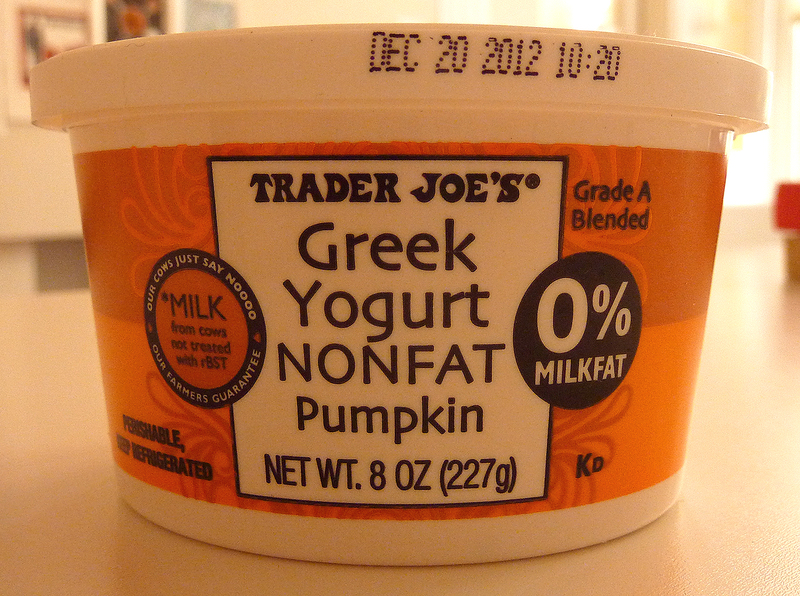 It struck me that this pumpkin yogurt wasn't as thick as most Greek yogurts, which, I must admit, I don't really like. I thought this "Greek" yogurt had the consistency of a normal yogurt instead. 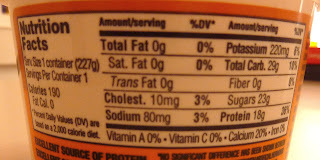 Sonia agreed, and added that although most Greek yogurts are low-fat, the fact that this Greek yogurt was non-fat might have contributed to its thinner-than-expected consistency. I'm not sure what facial expressions I usually make when I try stuff, but I'm pretty sure I grimaced just like Sonia. To me, it tasted like aspartame. 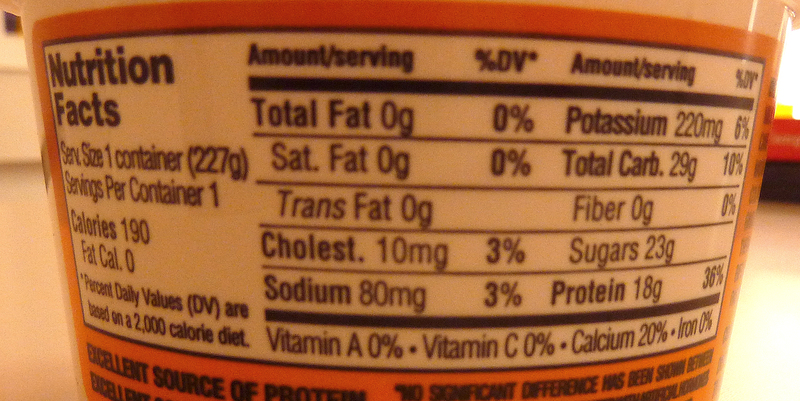 There's no aspartame on the ingredients list, to be sure, but I still swear it tasted like it. Sonia said it was too sour. We checked to make sure it hadn't gone bad. There was a month left until the expiration date. There was very little flavor. It tasted vaguely of sourness, nutmeg, and cloves, all in a small tub of plain yogurt. After all the expectation, all the hype, we felt pretty let-down. Especially Sonia. 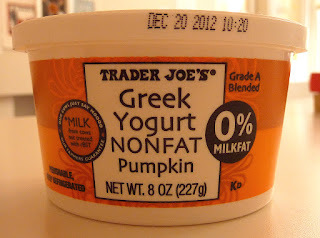 And again, maybe our taste buds are just numb to pumpkin after too many seasonal treats (most of which were way too sweet for our own good), but we weren't feelin' this Pumpkin Greek Yogurt at all. So once again, it was Pumpkin Butter to the rescue. The sweetness of the pumpkin butter made the yogurt much more palatable, and we were able to finish the little tub fairly quickly after that. But we're really reviewing these products for themselves, not for how well they mix with other Trader Joe's products. All in all, we felt this Greek yogurt was a big fail. But there are plenty of dissenting opinions out there. Let us know what you think of it in a comment below. Thanks! And happy Thanksgiving to everyone! Argh, I feel like a terrible person for putting up a negative review on Thanksgiving Day. Forgive me. 1.5 out of 5 stars from Sonia. 2.5 stars from me. btw, my daughter said TJ's has there own fully cooked turkey... she said her boss brought it in and it was good... Didn't notice it at my TJ's... how about yours? I didn't like it either... actually it was the second time ever I used their no hassle return policy! So disappointed (I'm a big pumpkin eater and yogurt fan) Maybe they'll reformulate next year and it will taste yummy like it should! Man, this was sold out at my TJ's and there were a bunch of people asking for it: "no idea when we'll get more in!" So imagine my surprise the other day when I saw a full shelf... I nabbed one and, HOLY COW, this is not good. I don't see the appeal at all. I added a bunch of honey to make it palatable but once is more than enough for this holiday novelty.